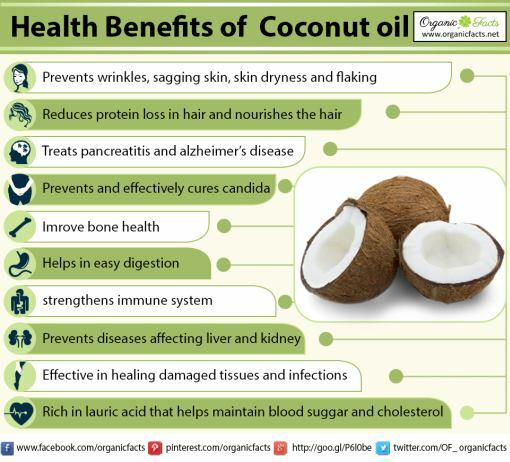 Heart diseases: There is a misconception spread among many people that coconut oil is not good for heart health. This is because it contains a large quantity of saturated fats.In reality, it is beneficial for the heart. It contains about 50% lauric acid, which helps in actively preventing various heart problems like high cholesterol levels and high blood pressure. Coconut oil does not lead to increase in LDL levels, and it reduces the incidence of injury and damage to arteries and therefore helps in preventing atherosclerosis. Study suggests that intake of coconut oil may help to maintain healthy lipid profiles in pre-menopausal women. Immunity: It strengthens the immune system because it contains antimicrobial lipids, lauric acid, capric acid and caprylic acid, which have antifungal, antibacterial and antiviral properties. The human body converts lauric acid into monolaurin which research has supported as an effective way to deal with viruses and bacteria that cause diseases like herpes, influenza, cytomegalovirus, and even HIV. Coconut oil helps in fighting harmful bacteria like listeria monocytogenes and helicobacter pylori, and harmful protozoa such as giardia lamblia. Coconut oil is often used by athletes, body builders and by those who are dieting. The reason behind this being that it contains less calories than other oils, its fat content is easily converted into energy, and it does not lead to accumulation of fat in the heart and arteries. Coconut oil helps boost energy and endurance, and generally enhances the performance of athletes. Coconut oil and Alzheimer’s disease: The research conducted by Dr. Newport states that the oil is useful in treating Alzheimer’s disease. Apart from this there is no scientific evidence or traditional knowledge of coconut oil being used for treating Alzheimer’s. In fact, it is not traditionally thought that the oil helps in boosting the function of the brain in any form. Carrier oils are those oils, which easily penetrate or absorb into the skin and thus facilitate seepage or absorption of other oils (such as essential oils) and herbal extracts through the skin when mixed into it.It is easily absorbed through the skin’s pores and thus is used as carrier oil. Furthermore, being one of the most stable oils, it doesn’t go rancid, nor does it let the other oils, herbal extracts, or medicines spoil inside of it. It does not alter the properties of the oils and herbs mixed within it. It also protects the herbs and oils from microbial or fungal interactions. Coconut oil is expensive in several countries; however, in tropical countries its cost is low enough to make it affordable as carrier oil. There are primarily 6 varieties of coconut oil: pure, refined, virgin, organic, fractionated and extra virgin (this is most debated form as there are no standards on virginity and it is unclear as to what qualifies as extra virgin oil). When you want to buy coconut oil, first of all, you need to decide why you need it and where you are going to use it. Your choice should be based on your need, like whether you want it for edible purposes or as a carrier oil to be used in aromatherapy, for massaging, for weight loss, or for medicinal purposes. Below is a list of such purposes and the type of coconut oil to buy. Furthermore, before you buy coconut oil, you should keep in mind that for edible and therapeutic uses, refined oil is the best as it is hygienic and clean. Unrefined oil is good for external applications like hair care and skin care. Unlike most other oils, coconut oil has a high melting point – about 24 to 25 degrees Celsius or 76-78 Fahrenheit. Therefore it is solid at room temperature and melts only when the temperature rises considerably. It is often in this form, and obviously, don’t keep it in your refrigerator. If you are using coconut oil for topical purposes, especially hair care, just melt the oil (if it is solid) by keeping the bottle in the sun or soaking it in warm water. You can also take some oil out and put it in a small bowl and heat the bowl over a flame (don’t use a microwave). Then, take the oil on your palm and apply it to your hair. If you want to use it for internal consumption, simply replace butter or vegetable oils with coconut oil in your recipes. Remember, you don’t need to completely switch to coconut oil, because then you will lose the other benefits of more traditional oils and dairy products. In colder countries, coconut oil comes in good, broad containers. However, if you get it in a pack (tetra-pack or plastic pouch), after opening the pack, be sure to keep the oil in containers with tight lid and broad mouth so that you can scoop it out with a spoon if it solidifies. Keeping it sealed or lidded is necessary because there are other admirers of coconut oil (ants, cockroaches, other insects and rodents just love it!). I don’t like the taste of coconut oil. What should I do? : Try using it in a variety of different recipes. However, if you get nauseated after eating coconut oil, don’t force yourself to eat it. As can happen with any food item, your body may be allergic to coconut oil and it is best not to consume it. Where to buy from? : Pure and refined coconut oils are easily available in most grocery stores, especially in tropical countries. For other varieties, you may need to search in larger department stores or drug stores. In countries which do not produce coconut oil, like the US, Canada, and most of Europe, you will need to visit big grocers or grocery stores in localities which have higher populations of people from India, Thailand, Sri Lanka, Philippines, and coastal Africa. Obviously, you can order it online as well and have it delivered wherever you live. Which brand to buy? : When you are buying coconut oil in packs, go for the reliable and reputable brands. Read the contents carefully and check the manufacturing date (although it has a long shelf life, fresher is still better). How much to pay? : The price of coconut oil depends on many factors such as its availability (cheaper where it is produced and more costly in other places, and it is even more expensive when ordered via phone, Internet etc.). The price is also affected by demand, variety (the refined one costs the least, followed by the fractionated, the virgin, the organic and the organic virgin coconut oils), brand, and quantity (buying in bulk costs a little less). How much to buy? Buy only as much you can consume in few months, because despite the fact that coconut oil does not go rancid for a long time, it is not wise to store it unnecessarily. 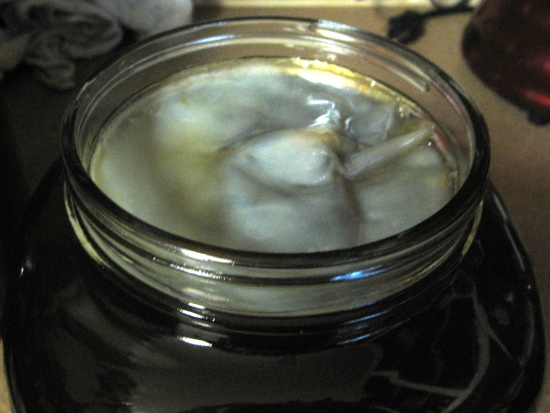 You will get better results with fresh coconut oil. More than 90% of coconut oil consists of saturated fats (Don’t panic! It’s not as bad as it sounds, read to the end of this review and your opinion may change), along with traces of a few unsaturated fatty acids, such as monounsaturated fatty acids and polyunsaturated fatty acids. Virgin coconut oil is no different from this. 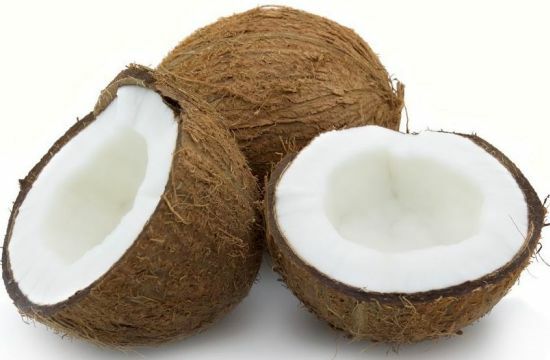 Poly-phenols: Coconut contains Gallic acid, which is also known as phenolic acid. These polyphenols are responsible for the fragrance and the taste of coconut oil and Virgin Coconut Oil is rich in these polyphenols. Hope this will be of some help to you. Got any suggestions? Your comments are welcome! You may also share this information with your friends. Thanks! (NaturalNews) The pomegranate is one of the world’s oldest known fruits and has long been considered a symbol of health and fertility in its native Persia (modern-day Iran). It is also one of the most interesting fruits to consume: After splitting apart the pomegranate’s tough outer layer, a complex chamber of red seeds lies before you. These small seeds (and their juice) are the only part of the pomegranate that is edible, but — as numerous studies prove — their nutritional value is considerably greater than what you might expect. Protection from skin cancer — According to a study published in Experimental Dermatology in June 2009, pomegranate juice and oils can protect our skin from solar radiation, thereby guarding us from skin cancer associated with excessive sun exposure. The researchers ascribe this result to the anthocyanins and tannins present in pomegranates, which provide impressive antioxidant and anti-tumor properties. (1) These same properties also provide anti-aging benefits, and can shield us from degenerative diseases like Alzheimer’s and rheumatoid arthritis. Reduce cholesterol — Studies have shown that the regular consumption of pomegranates and pomegranate juice can reduce LDL cholesterol in both animals and humans. One study featured in The American Journal of Clinical Nutrition in 2000, for instance, discovered that pomegranate juice helped inhibit the oxidation of LDL cholesterol in human subjects. (3) Excess LDL cholesterol is one of the biggest contributors to coronary heart diseases, which is the most common type of heart disease in the United States. High in nutrients — Pomegranates are surprisingly rich in nutrients. In fact, their seeds contain more fiber and minerals than many other more popular fruits. For example, one whole pomegranate contains around 11 grams of dietary fiber (twice the amount of fiber of an average-sized banana), 29 milligrams of vitamin C and 46 micrograms of vitamin K. (5) In all three instances, these numbers average at about 50 percent of our recommended daily intake. Like all fruits, pomegranates are best eaten raw for maximum health benefits. When purchasing them, select organic pomegranates that feel heavy for their size and radiate a vibrant, unblemished skin. These are the best-quality pomegranates and can be refrigerated for up to two months without having their nutritional value compromised. One of my mom’s favorite tricks for making a home smell inviting was to put together this warm stovetop potpourri that made cinnamon and citrus waft through the house. It’s the type of thing that makes you think of homemade pies, and baking, and herbal chai teas. Studies have shown that cinnamon’s scent helps us concentrate and stay alert, which is just what I need when keeping track of preparations for a big meal, so it provides benefits to guests and the cook! It’s the perfect thing to have going on a gloomy cold day, or to use when welcoming guests into your house for a holiday meal. And it couldn’t be simpler to make. Combine all of the ingredients in a medium pot. Bring to a boil, then turn to very low, and gently simmer. Just make sure you keep checking the water, to make sure it doesn’t run dry. If you’re new here, you may want to sign up for FREE weekly updates delivered to your inbox featuring Real Food recipes, nutrition & health articles, and the latest in sustainable agriculture, food politics & philosophy. I confess. I had an addiction to Dr. Pepper. It seemed innocent enough at first. I was a college student in desperate need of caffeine. My husband — then boyfriend — had a case of Dr. Pepper made with real cane sugar (no HFCS!) in his closet. He offered me one. I accepted. I was hooked. Over the next ten years, I periodically tried to wean myself from the soda. I gave it up for Lent more than once. I told myself how evil it was, how bad for me, how disappointing it was to drink. I couldn’t knock the habit. Kombucha — the fizzy, mildy sweet and tart, health drink that works wonders detoxing our bodies. It satisfied my cravings for a fizzy energy boost without the sugar crashes that accompanied my Dr. Pepper drinking. A 16 oz. bottle of organic raw kombucha costs around $3.50. Multiply that times several family members and a couple of glasses per day, and it adds up quickly. If you could brew your own flavored kombucha for as little as $1.50/gallon and about ten minutes of your time, why wouldn’t you? Here’s how I do it. This makes 2 gallons. Second — each mother comes with at least a half a cup of liquid with it. That is important stuff so do not pour it off. You’ll actually use that in your first batch of tea. I recommend buying a bottle of Kombucha from the health food store to help your first batch, but this isn’t needful. If you choose to do it, you’ll want to buy Organic Raw Kombucha without any fruit sweeteners added. Finally — the starter is a bit strange and takes some getting used to. Handling it and placing it on top of the tea just takes a little practice and a sense of adventure … it is pretty disarming initially. One final note — EVERYONE will tell you something different. Brewing kombucha is just like making any other dish. There are hundreds of variations and recipes out there, each one somebody’s favorite. Everyone will swear doing this or that particular thing will make the beverage more healthful for you — and often the advice is contradictory. My point? Relax. Just do it. Enjoy it. Experiment and see what works for you. Boil about 2 gallons of fresh, filtered water on the stove top. (Where to buy water filters). 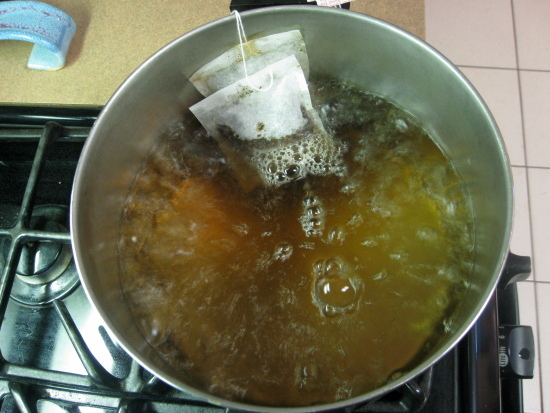 Once water is at a full boil, remove from heat and add tea bags or family-sized tea bag and steep for 5 minutes. You can use cheap, plain Lipton tea for this, or experiment with other black or green teas as you desire. Remove tea bags and add 2 cups of sugar stirring vigorously until it is dissolved. (This is the only thing in my house we use refined sugar for. 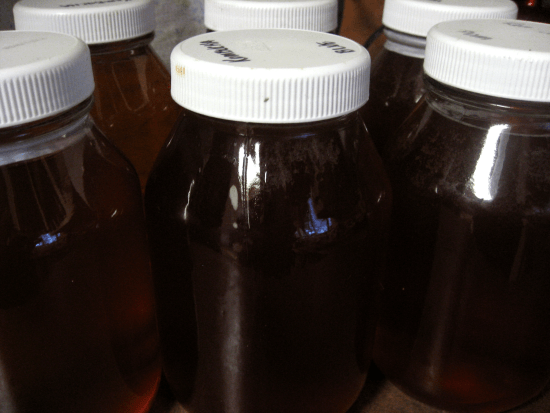 We tried brewing kombucha with natural sweeteners like sucanat, honey, or agave nectar, but they all made the final brew take longer and taste sour. There’s no need to fear this refined sugar because it’s basically just food for the yeast.) Let the sweetened tea sit on the stove top until it has cooled to room temperature. This usually takes about 2 hours. Once tea is cooled down transfer to glass jar or jars with a wide mouth. (The kombucha doesn’t brew as well in metal or plastic containers. 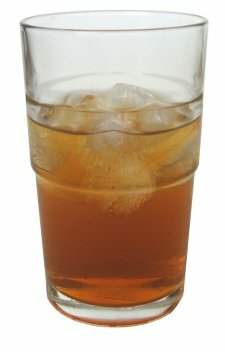 You can use a large glass bowl, glass pitchers, or a large glass sun tea jar – anything glass that will hold your tea.) Pour the half cup of liquid that comes with the mother into the sweetened tea. Carefully place the mother on top of the tea mixture. Cover your glass containers with a clean kitchen towel and place away from direct sunlight. I secure the towel with large rubber bands. The kombucha needs oxygen to ferment, so you’re using a towel rather than a lid to allow air to circulate. The rubber band secures the towel to keep out flies, insects, or other contaminants. Days 1-5: Ferment Tea (allow starter / mother to “eat” the sugar and produce acids & enzymes …) You will allow the tea mixture to set out in the dark corner of your kitchen for 5 days. You can forget about it or you can peek. Either way on the morning of day 5, remove the mother and set it aside on a plate, pouring about a half cup of the fermented tea mixture over the mother to keep it moist. Put it in the refrigerator. Every other batch or so, you’ll be able to separate the old mother from its “baby” which will have grown on top of the old mother. (It may separate on its own, or you may just pull them apart.) When that happens, the baby will become the mother for your next batch of kombucha tea. The “old” mother can be passed on as a gift or discarded. Pour clear fruit juice (no pulp, it causes much stringy nastiness!) into the smaller glass jars or bottles you’re using to bottle your kombucha. I use about 2.5 oz. of fruit juice per quart-sized jar. You can use any size bottle or jar, just be sure to adjust the fruit juice accordingly. You’re looking at a cranberry apple juice blend. Pour kombucha tea on top of the fruit juice, allowing about an ounce of breathing room at the top of the bottle, close bottle tightly. Be sure to save at least 10% of your brewed kombucha to use with your saved mother in your next batch. To ensure a consistent brew, I save about 25% of mine. Place bottles back in your “fermenting place” for 48 hours and cover with a kitchen towel so they avoid exposure to direct sunlight. Repeat the process for Day 1, Parts One and Two, and use the mother you set aside earlier as the mother for this batch of kombucha tea. Put bottles in the refrigerator and chill completely before opening. Do not shake. When you open, remove the thin film of new “mother” that accumulated on top during the fruit juice fermentation phase. Contents will be bubbly. Enjoy the fruits of your five or ten minutes of labor. Periodically, you may notice your kombucha changing flavor in a way you don’t like. When that happens, I usually add a bottle of Organic Raw Kombucha into my fermenting sweetened tea to restore the balance to the yeast and bacteria. If you don’t want to do that, this website has a helpful index for “fixing” problems with your kombucha culture. Also, your kombucha mother may turn brown, or bubbly, or do all sorts of strange things. None of these are problems. The only thing you want to really look out for is mold, and if it molds it will look like the mold on bread – fuzz and all. These instructions are assuming that the room temperature where you’re brewing your kombucha is around 75 degrees. (I’m in Texas, what can I say?) If the temperature is considerably warmer than this, it will take less time to ferment. If it is considerably cooler than this, it will take more time to ferment. As such, people find that during the winter in cooler climates they may let their kombucha ferment for up to a week longer than they do during the height of summer. How can you tell when your kombucha’s ready to be bottled with fruit juice? When it’s mildy sweet and mostly tart. Check out this post on Kombucha Questions & Answers and see if it can help. Also, be sure to read through all the comments at the bottom of this post. A lot of interesting questions & answers have been posted here over the years.